Since my 2011 stroke, my observations of the signs of spring have been mostly from our vehicle. This year my view through the windshield has been especially memorable thanks to azaleas and red maples. 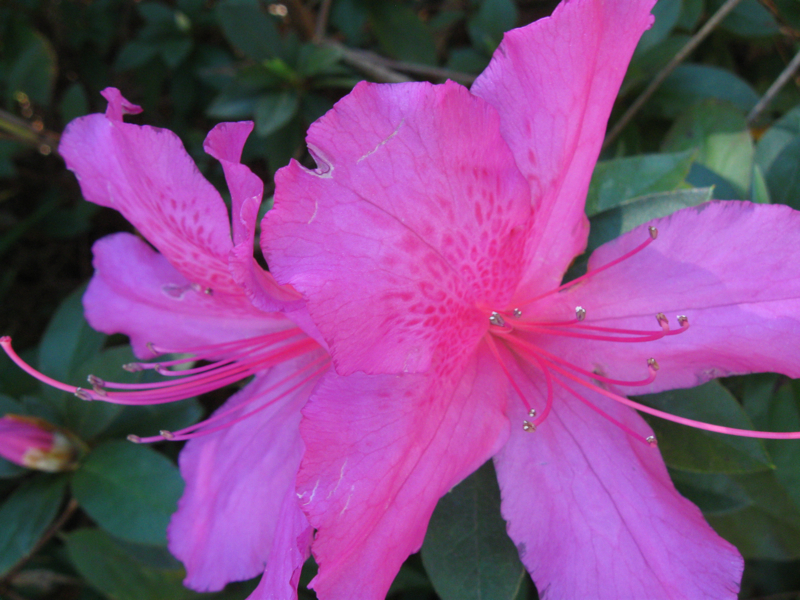 The exuberant, flamboyant pinkish purple of the Formosa variety of Southern Indian azaleas first appeared in my yard at the end of January and they were blooming all around our area in February. They look their best when they have room to spread out, the bushes hidden in blooms and shaped like the hoop skirts of antebellum ball gowns. There were a few ethereal whites, red, hot pinks and pale pinks. But it was those old-time Formosas that created billows of unbroken color along property edges. A few days before the official first day of spring, most of the azaleas here had already reached their peak. Backyards, front yards or peeking over privacy fences, they start my spirit singing of spring. I also love the early reawakening of the red maples. It wasn’t far into the new year when I noticed the red winged seeds of a maple along a street we travel regularly. 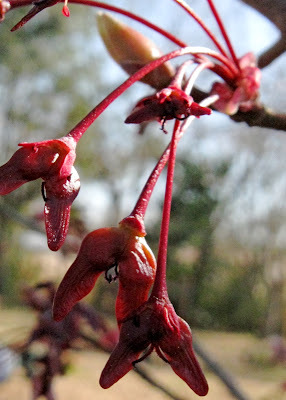 When Husband Walter and I took a day trip to Louisiana in early March, red maples continued to show off. They graced the edges of pine forests. As we drove the interstate lanes and bridges, I could also see them scattered among the bare, gray branches of deciduous trees that were still sleeping in flood plains. What struck me was the variety of color, and I spent much of the drive mentally trying to find words to apply to each color and order them into a progression of shades and tints. I saw pinkish beige, pale coral, salmon, rusty red, scarlet, deep burgundy and more. My vocabulary was totally inadequate. My effort might even cause a groan from the artistically gifted. But it was an enjoyable spring exercise. My sympathies to all the snowbound. Tonight and several additional nights temperatures are forecast for the 30s, unusual for our northern Gulf of Mexico coast this time of year. The temperature started dropping in the afternoon today, and Hubby will be out taking steps once again to protect the four tomato plants that I bought and insisted we plant several weeks ago. Wishing you a great week with congenial weather! Oh I am envious. Mother Nature dumped a load of snow on us. Next week it will be 70s again. Warm and sunny here, but someone mentioned rain....which we need. The azalea picture is beautiful! What are these spring Wings? Are they part of a red maple? We are in the middle of a two day snow storm now, any flowers there were are all under the snow now. Your azaleas are just beautiful. I love them but have never had any luck with them. Oh dear, you are getting the cold also? Hope your tomato plants survive. My early veggies have survived the unusual cold and even snow but the driving winds we have had have really whipped them. I love azaleas, which are quite expensive when one buys them in pots here in Hawaii. I've been enjoying our azaleas, and dealing with sweeping up maple blossoms for about a week. The weekend rains took a real toll on the azaleas, but I'm hoping some will survive until Easter.